Hard on the heels of his success in designing the IBM Building two blocks to the north on Madison Avenue, Edward Larrabee Barnes got another chance to play with angled facades and cut-away bases with this silvery tower. Here, the results are neither as spectacular nor as luxurious, but considering that the site is much smaller and that it was a speculative rather than "institutional" project they are still impressive. 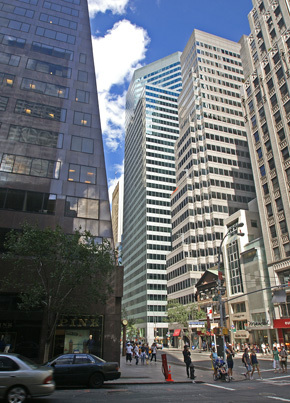 The facade treatment, as shown at the left, was obviously derived from Citicorp Center just two blocks to the east and while it can hardly be said to be contextual it was not a bad choice since such a treatment is quite elegant and the Madison Avenue ambiance in this neighborhood was neither consistent nor refined. Indeed, this intersection is now one of the more interesting ones in midtown as directly across from this tower is the zig-zaggy tower at 527 Madison Avenue (see The City Review article) and catty-corner to this is the sharply sloped base of the large office tower at 520 Madison Avenue (see The City Review article). Directly opposite this tower on the avenue is a bunch of undistinguished, older, low-rise structures. 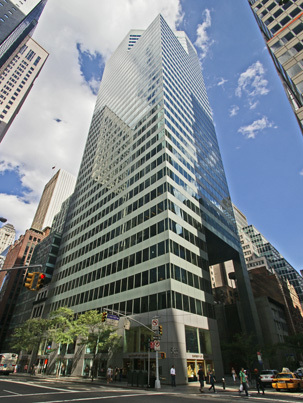 The developer, Park Tower Realty, headed by George Klein, was, at the time, one of the most active commercial builders and was noted for commissioning different "name" architects for its projects: I. M. Pei for its black building at 499 Park Avenue (see The City Review article), Helmut Jahn for its slanted midtown tower nearby at Park Avenue Tower, and Philip Johnson for its crenellated tower at Federal Reserve Plaza downtown. 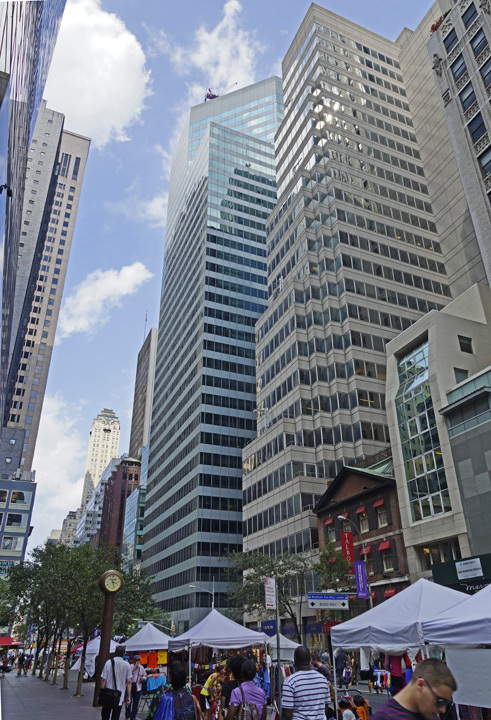 Until his IBM tower (see The City Review article), Barnes, who also designed the Asia Society Building on Park Avenue at 70th Street, was not in the top ranks of celebrity architects. His solution for this 36-story, 440,000-sq. ft. building was to create a mid-block plaza whose size is enlarged by cutting away, at an angle, a large portion of the base of the tower. The plaza has a waterfall and trees and opposite the angled entrance to the building, whose large and handsome lobby is glass-enclosed. Unlike the IBM Building, however, whose cut-away corner and main entrance is completely opened beneath the cantilevered tower, the cut-away corner here has a tall, but slender column that supports that corner of the tower. (The cost of the IBM cantilever was considerable, about $10 million at the time of its construction.) The column here makes the cut-away less dramatic, but is not too obtrusive. The midblock plaza is not bad although it does open up views of the backs of some neighboring buildings that are not ideal. The popularity, in the press, at least, of nearby Paley Park, led to a proliferation of mid-block plazas in midtown and they do make a fair bit of sense as they permit towers to maintain building walls on the avenue, which is urbanistically good, while also opening up congested midtown and providing places for seating, cogitating and eating. The asymmetry of the building is good and the angled, cut-away top that faces southwest not only provides tenants there unusual and spectacular views but also serves as a prow that provides dynamic interest to the skyline. The detailing here is crisp and clean and the building has always had high-end tenants in its avenue retail frontage. For its modest size by Midtown standards, this is a fine, cool, little tower.